Wow - time sure does fly by. I can’t believe One Squared is already in the past and we are looking forward to next year’s event. It seems like so long ago we started planning this event and now that it’s been a few weeks since the big day, I’ve had time to reflect. Here are a few things I took away from attending this event. Spoiler alert: THERE WAS A LOT! I believe it was Mark Schaefer who said those words, and as simple as that sounds and you might be thinking “Duh Ashley” it really did speak to me. It’s so easy to get lost in the world of social media and get sucked into things that aren’t true. Take for example your Instagram account, if you are like me (and most people) you are probably guilty of endlessly scrolling through photos of other people's lives … and their lives seem so perfect. It’s easy to feel a pang of jealousy and think they have it so much better. We think this because these people are only showing the best moments of their lives … never the lows. The point of this Instagram rant is if these people acted more human and showed the highs mixed in with the lows and the funny parts - wouldn’t they be more relatable, thus more likable? The answer is a big fat resounding YES! Kristen Brown further backed up Mark’s point by leaving us with the words, “Be more of the true you, more often.” Amen Kristen. The way I decided to apply this to Leighton Interactives’ social media platforms is by asking myself, what would our followers want to see on social media? This is why you may have seen more ‘culture’ posts lately on our feeds; #TipTuesday, #GuessTheDesk, welcoming new employees and saying goodbye to others, posts like these make us more than just a brand - they make us human. So… maybe I can’t just stick to only one favorite takeaway. Social sharing was also an important topic discussed throughout the day, and for good reason. Everyone wants to be the next big viral hit online, but not everyone wants to put the work in. I was furiously scribbling notes throughout the whole day, and I’m glad I did. I think these quotes explain social sharing better than I could say it in my own words. So what do all of these quotes mean? 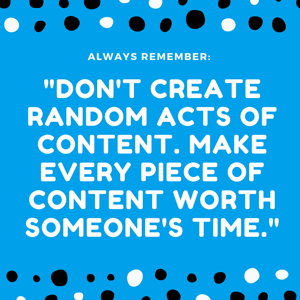 To sum it up for you, sharing content is like the domino effect. When you share relevant and useful content, your network sees the content. If they like your posts they’ll click that share button, and assuming they have a network of like-minded friends; those people might see the content and also click share. And on and on the cycle goes. Obviously, even with the best of intentions, not every piece of content you share is going to go viral, most probably won’t even get re-shared. It isn’t because people don’t like your company, it is simply because there is so much content out in the world for people to see, share, and like. You’ll hit content gold if you can create a piece of content that people eat up and spit out, metaphorically speaking of course. Don’t worry - even if you aren’t going viral overnight you are still gaining valuable brand impressions, engagement, clicks, and visits. Whether you were able to attend this year or you missed out, I hope to see you there next year. We already started planning the event and it’s going to be even bigger than this year's. We’re asking you for your input too - we really want to know how you want to experience One Squared. After all, this event is put on for you! Let us know what you’d like to see at One Squared 2019, here. All and all, One Squared 2018 went above and beyond my expectations (and I thought I knew what to expect). Ryan, Alina, Mark, and Kristen sparked ideas, made me rethink my tactics, and even gave me some actionable items to take with me - thanks Alina for that Brand Brief! From laughter yoga with Kristen Brown to Growth Hacking with Ryan Holiday, my professional and personal cup were definitely filled to the brim with social media gold. I even knocked some things off of my personal to-do list thanks to Kristen, (hello clean closet)!